For fans of the high-stakes tension of the New York Times bestsellers Luckiest Girl Alive and The Lying Game, a razor-sharp page-turner about female ambition and what happens when fake violence draws real blood. After years of struggling in the Chicago theater scene, ambitious actress Kira Rascher finally lands the role of a lifetime. The catch? Starring in Temper means working with Malcolm Mercer, a mercurial director who’s known for pushing his performers past their limits—on stage and off. Kira’s convinced she can handle Malcolm, but the theater’s co-founder, Joanna Cuyler, is another story. Joanna sees Kira as a threat—to her own thwarted artistic ambitions, her twisted relationship with Malcolm, and the shocking secret she’s keeping about the upcoming production. But as opening night draws near, Kira and Joanna both start to realize that Malcolm’s dangerous extremes are nothing compared to what they're capable of themselves. 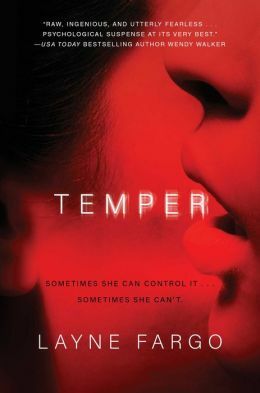 An edgy, addictive, and fiendishly clever tale of ambition, deceit, and power, Temper is a timely, heart-in-your-throat psychological thriller that will leave you breathless.